When you choose to live in a new place you can only stay so long on the outside. Eventually where ever you are you become caught up in being part of where you are. London is no exception. To be a Londoner or perhaps more correctly to be British, you are involved in everything to do with the pub. An outsider may see this merely as a drinking house. Not so. The pub is the very essence of Britishness. It is also very complex. I don't profess to know anything about it. I am Fresh Eyes remember! Yesterday I posted a picture of a pub with one of the hand painted signs. Now I know a whole lot more, not just about this pub but a few other as well. Babooshka told me about the relationship that particular pub has with the infamous Kray twins. Elaine Saunders - Complete Text has written a book about pub names. Nellie Dean's is also one of the most famous bars in Blackpool which has a large gay population. Thank you for the mention and answering the question from yesterday. Your fresh eyes really to put a new spin on the place. I forgot to say in answer to your query about whitecahpel. Jack the Ripper territory so probbably lots of gory stories to be found. Not at all a pleasant man, whoever he was. The most interesting, and challenging, part of daily blogging is seeing others' reactions to something they might not really understand so thanks for giving us some background on pubs. 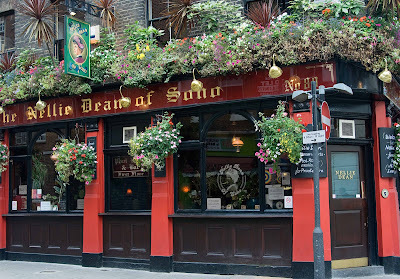 Very nice flowered pub façade. Fantastic post and outstanding photo. I'm appreciating learning about the Pub Culture as well. There are many British Pubs popping up around here because of the British Invasion going on right now, so this brings some understanding to the 'why' of it. I think I could fit into the London Pub Culture quite nicely! Heya. It's Suzie Bee here. I understand you read/used to read my blog. I deleted it today, but may decide to keep blogging (friends only) at my old livejournal (http://staystrange.livejournal.com). Sorry, I hope you'll understand. I'll still look forward to your photos. Oh, and by "friends only" I don't mean push off - I mean feel free to add me as a friend! What a great history and i think learning is all part of the "freshness"- I enjoy seeing London your way! It's true - I don't see pubs as mere drinking houses, but superb places to socialize. I love them - and I don't drink!